Perform the following steps to export all mappings currently available in Controller Manager. This way you can create a backup of all of your mappings. Click the Export button in the lower part of the Preferences dialog. 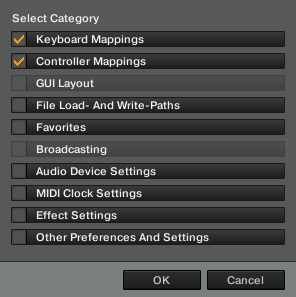 Make sure that only the options Keyboard Mappings and/or Controller Mappings are selected. Open the folder where you want to save the mappings.